Onboard fires are one of the two most common reasons boaters are forced to abandon ship (other than the obvious one of having your boat sink). Fire extinguishers protect you, but most boaters tend to ignore them. Here’s an opportunity for a quick refresher on this crucial safety gear. The Coast Guard requires from one to three extinguishers on pleasure boats, depending on whether they have enclosed engine compartments and if there is a permanently-mounted fixed extinguisher system in the engine room. Like other Federal requirements, these are really minimal. 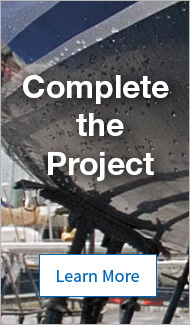 Buy enough to satisfy the requirements and then address the needs of your particular boat. These are the minimums to pass the Coast Guard inspection if you get boarded, but extinguishers are only effective if you can get to them. We recommend at least one in the cockpit, one in each stateroom and one in the galley area, reachable even if the stove is on fire. Statistically speaking, an onboard fire doubles in size every seven seconds, so having a fire extinguisher readily available may make the difference between inconvenience and catastrophe. 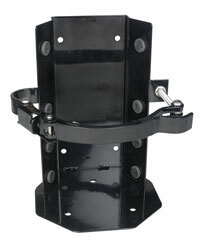 Mount your fire extinguishers in brackets where they’re available for immediate use and to keep the heavy cylinders from crashing around inside a moving boat. What materials will they extinguish? Class A fires leave an ash—all combustible solid materials, such as paper, wood, cloth, rubber, and many plastics including the fiberglass reinforced plastic used for decks and hulls. Class B fires boil—all flammable liquids, including stove alcohol, grease, gasoline, diesel, kerosene, oil, oil based paint, teak oil, paint thinners, acetone, varnishes, and flammable gases or fumes. Class C fires involve a charge—all energized electrical equipment. Class C fires are identified for their potential to electrocute or shock a person if you apply electrically conducting water-based extinguishing agents. Turning off the electricity is the top priority when fighting a Class C fire. Usually you can turn off the main battery switch. Safe and effective circuit protection is likewise crucial for preventing Class C fires. Cutting the power will change the status of a Class C fire to a Class A and/or B fire. Ratings on a fire extinguisher reflect an extinguisher’s ability to combat particular classes of fires. Underwriters Laboratories (UL) uses letters to denote the type of fires the extinguisher is capable of fighting, and numbers to refer to the fire fighting “capacity” relative to other extinguishers. For example, a 1-A;10-B:C extinguisher is effective on Class A, B, and C fires, and a 40-B:C extinguisher isn’t rated for Class A fires, but has four times the extinguishing capacity of a 10-B:C extinguisher. The Coast Guard quantifies extinguisher abilities differently from UL, and they use the terms B-I and B-II. The difference is that the Coast Guard looks only at the weight of the extinguishing agent, while UL looks at the fire fighting ability. This table shows how the Coast Guard and UL classifications align, and how much active ingredient is stored in each class. Halotron I extinguishers are clean, effective and leave no residue. See a demonstration in one of the BoatU.S. videos. What type of extinguishing agent? Water – Good for Class A fires. 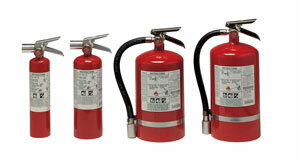 Extinguishers are heavy, difficult to store, and are NOT for use on flammable liquid or electrical fires. Carbon Dioxide (CO2) – Good for Class B and Class C fires. No residue. Easy to use. Useful only in confined interior spaces. Does not cool fire. 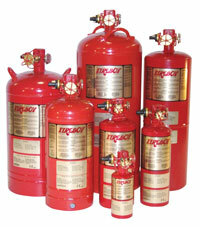 HFC-227ea – Relatively non-toxic Halon replacements are effective on all fire classes. Expensive. Novec™ 1230 – New 3M agent is an environmentally-sustainable replacement for HFC-227 or FM200. No potential damage to the ozone layer or global warming potential. Effective on all fire classes and leaves no residue after use. Halotron 1 – EPA-approved. Safe for computers, electronics, even clean rooms, and leaves no residue after use. Dry Chemical – Low toxicity. Inexpensive. Effective on Class B and Class C fires. Not effective on Class A fires. Difficult to clean up. Tri-Class Dry Chemical – Low toxicity. Inexpensive. Effective on Class B and Class C fires. Moderately effective on Class A fires. Difficult to clean up. Corrosive. Not a good choice for helm or nav station. Aqueous Foam – This relatively new technology is extremely easy to use effectively on Class A, B, and C fires. Avoid excessive skin or eye contact. BoatU.S. tested fire extinguishers in 2009. View their highly informative series of seven short videos. Typical fire extinguishers have a discharge time of only about 10 to 12 seconds, so you have to use them before the fire gets too large. Deep-seated fires that seem to be out may flare up again, and this short discharge time, combined with the possibility of reflash, are important reasons to carry extra extinguishers onboard. Do you want a fixed automatic system? Engine room fires are the most common causes of onboard blazes, with 90 percent of onboard fires starting in the engine room, according to the Coast Guard. The BoatU.S. insurance division breaks these fires down as follows, according to their records of actual claims. Electrical wiring fires are most numerous (55 percent), followed by engine and transmission overheating (24 percent), DC engine circuits (12 percent) and fuel leaks (8 percent). Select an automatic engine compartment system by calculating the volume in cubic feet of the engine space. Install the extinguishers either horizontally or vertically. Boaters can protect themselves by keeping up with routine maintenance of their mechanical and electrical systems. This includes keeping water intake lines free of debris and weeds, replacing raw water pump impellers, and keeping exhaust manifolds and risers free from blockages caused by rust deposits. Unfortunately, fires do happen to even well-cared-for vessels. Often, the engine will start to sputter or someone will see or smell smoke, and the first impulse is to open the engine cover or the door to the engine compartment. This well-intentioned reaction may be the worst thing to do, engulfing you in noxious billowing fumes and feeding oxygen to a smoldering fire. Automatic fire extinguishers, like the MA2 Manual/Auto Clean Agent Fire Extinguishers, remove this possibility in boats ranging from sterndrives to large yachts, and fight the blaze right from the start, while it is still capable of being extinguished. They trigger automatically when a temperature sensor reaches 175°F, or you can discharge them manually by pulling an optional Manual Release Cable when you discover the fire. Select the cable by length (from 6' to 40'). The system releases a clean agent (HFC-227ea) for about 10 seconds, smothering the fire and leaving no residue behind. An LED indicator display on your dashboard (that fits a 2 1/8" cutout) shows engine compartment system charged/discharged status. A remote 85dB horn also sounds when the extinguisher is low on pressure or has discharged. Our old 1976 Newport 30 sailboat had one of these automatic systems located above the Atomic Four gas inboard, and we had a good feeling of security knowing it was on the job 24/7. Automatic extinguisher systems with HFC-227ea do not cause a diesel engine to stall, and they’re safe to use if you happen to be in the engine compartment. If there is an engine room fire while you’re under way and the automatic system discharges, the engine, generator and bilge blower systems need to be immediately shut down, either by you or by an electronic device. Otherwise, your diesel keeps chugging away, feeding oxygen to the blaze and sucking the fire-retardant out of the compartment (and into the engine air intakes or out the ventilation exhaust fans), rendering your fire-fighting system ineffective. Automatic engine shutdown units take care of this in an instant. 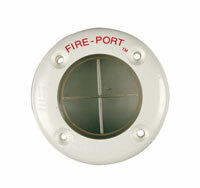 If you own a smaller boat, or live within a limited budget like many of us, an inexpensive alternative to automatic systems is the Fire Port, a clear 2 11/16" diameter plastic port that you can install in a hatch, engine cover or bulkhead. You can see inside the engine compartment without opening the hatch, and if you see evidence of a fire, simply bust out the small plastic window with the nozzle of your fire extinguisher and safely blast away. Halotron I portable fire extinguishers are excellent for this application, since they leave no residue and fight the fire by removing oxygen. Where should the extinguishers be located? Extinguishers are only effective if you can get to them. We recommend at least one in the cockpit, one in each stateroom and one in the galley area, reachable even if the stove is on fire. Statistically speaking, an onboard fire doubles in size every seven seconds, so having a fire extinguisher readily available may make the difference between inconvenience and catastrophe.